Finally, a moment anticipated by many: test results of Intel's new LGA1155 platform are available. This resembles the situation with LGA1156, because the new processors will be rolled out in several steps. Today we'll get to know the details of quad-core models based on the Sandy Bridge architecture. The more affordable dual-core models will arrive in almost a month and a half. And new Pentiums will be rolled out even later, not in the first quarter. On the upside, there will be more Pentiums this time, compared with the LGA1156 series, and those will be more affordable at that. Celerons should arrive some time later as well. In other words, the company has learned from the past experience of LGA1156's "protracted start" and will most likely avoid such mistakes in the future. Thereby, starting from the second or third quarter, LGA1155 will allow to retire the old LGA775 socket and will finish off LGA1156 by the end of the year as well. But until that happens the three platforms will coexist. Together with LGA1366 (which is bound to last until the year-end), this will only increase the confusion in the market. Well, we cannot change that. What we can do is examine existing solutions and make right choices. There will be no theoretical part today, because a detailed review of the microarchitecture is coming. We also won't dwell on the integrated graphics core for now: this topic also requires a dedicated review. Right now we'll focus on the processor part and see how it fares against the competing solutions from Intel and AMD. While the LGA1156 series first got two Core i7 processors and one Core i5 CPU, the today's lineup has an opposite ratio: one Core i7 to three Core i5. The reason is simple: higher-end Core i7-800 processors remain in the market and offer adequate performance, there's no reason in impeding them. But the Core i5 family is too diverse. It features both faster Core i5-700 CPUs without built-in graphics and slower Core i5-600 CPUs with built-in graphics. So Intel is going to eliminate this disbalance first. Note that from now on Core i5 will always mean four cores, while the older variant with two cores and four threads will only remain in the cheaper Core i3 lineup. But these processors will be rolled out a bit later, because the existing Core i3-500 series is still all right. What can we learn from the comparison of specifications? Previously, the Core i5-700 and Core i7-800 series only differed by Hyper-Threading support and clock rates. Now the difference is slightly bigger: Core i5 has smaller cache. This lineup has interesting organization: the increments in the initial clock rate differ, but the increments in the maximum boosted clock rate are consistent: another 100 in the processor rating means another 300MHz of clock rate. 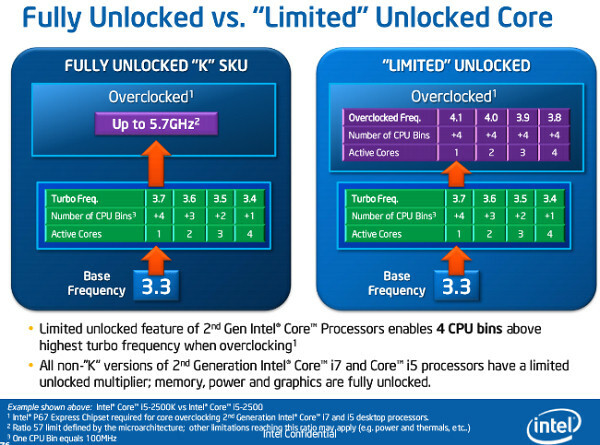 This is a significant change, because both Intel and AMD have already taught us that the next processor in a lineup only has multiplier increased by 1. It's still unclear whether this trend will stay or the company will eventually compact the series, so let the time tell us. In our opinion, this is a change for the better, because the great number of processors in the market already creates much confusion. Still there's space for improvement as well: Core i5-2300 looks a bit strange, being only slightly cheaper than Core i5-2400 but lagging behind in clock rate more than higher-end models do. This gap narrows in single/dual-thread applications, but their number is decreasing. Besides, multithreading is needed by background processes as well, and sometimes those require much resources (moreover, some of those have become multi-threaded too). Speaking of the Turbo Boost mode, well, we expected more. The maximum boost is reduced to 400MHz (remember that a newer step is 3/4 of the older step); the dependence on the number of active cores still remains, although it's been rumored that the new processors would allow increasing the clock rate of all cores to the maximum. The only considerable change is that the boost mode can now be used right up to the TDP level (the threshold used to be lower), and even higher if needed (for a short time). This should give a certain performance boost under heavy load. But the key innovation for overclockers is that now Turbo Boost supports Limited Unlocked Core that allows setting multipliers to Max Turbo + 4. In other words, now a regular Core i7-2500 should be able to work at 3.9GHz with all cores under load and at 4.1GHz with one core under load! In reality this proved to be even more interesting: a Gigabyte motherboard we tested the new processors with did limit the multipliers, but it allowed us to set the maximum value (42) for any number of active cores of the Core i7-2600. In other words, a 3.4GHz processor easily transformed into a 4.2GHz one. We believe that other P67-based motherboards (maybe except for those made by Intel) will allow to do the same. Motherboards based on the P67 chipset also support Fully Unlocked Core that allows using multipliers up to 57 in any mode. However, that requires a K series CPU. We must add that not just overclockers might be interested in the latter (as you can see, adding 700-800 MHz is possible with regular processors as well). The K series solutions feature HD 3000 graphics core, while regular models have HD 2000 graphics with half of execution units disabled. So these processors will be very useful to owners of H67-based motherboards. The built-in graphics won't be available for P67-based solutions (no FDI link), but these boards will allow overclocking both cores and memory to the max: while DDR3-1333 is officially the limit, it only affects H67. The P67 will let you use higher multipliers, offering memory clock rates up to 2133 MHz. Besides, such motherboards will allow manual TDP adjustment (increasing it for overclocking and reducing for power saving). Previously, this was only possible with extreme processors. So as you can see, developing CPUs and chipsets for LGA1155, Intel has learned from all the past experience and introduced proper order in positioning. We added the last two models just out of curiosity. There will be no shame in losing to them. Although we suspect that Core i7-2600 won't yield to i7-975 Extreme Edition. As for the Core i7-980X, to compare it with the rest should be very interesting. Now let's proceed to competitors made by AMD. The Phenom II X4 970 is a quad-core CPU with the maximum guaranteed clock rate (Core i7-2600 only achieves 3.5GHz in the boost mode, the rest cannot do even that). As for the Phenom II X6 1090T, the release of this lineup allowed AMD to return to the $200-$300 market segment, because these processors neatly fit between the higher-end Core i5 and lower-end Core i7. Let's see if this positioning remains with Intel's novelties released. The newer Phenom II X4 975 and Phenom II X6 1100T only offer slightly higher clock rates and cannot change the situation radically.